I was born in Withington South Manchester to parents from 2 Manchester Irish Catholic families. As a child and to this day, I always felt I was Irish. I never felt any attachment whatsoever to Britain and I never shall. Imagine my surprise recently when I had my Ethnicity DNA done. But more of that later. Life never turns out as we expect does it . The one constant is my wonderful, wonderful family and extended family whom I absolutely love. My immediate extended family ( brothers' families ) on my side has 27 people and my husband's immediate extended family has 34 people then we start on first cousins. My husband has 54 first cousins , just first cousins. We can't start counting any further. My father in law was the youngest of 15 and my mother in law the 2nd of 9. My dad was the 7th of 11 children. So, maybe not the largest family on the planet but fairly large. 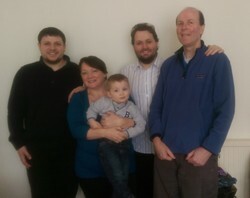 This is me with my menfolk, husband of nearly 38 years and 2 sons and grandson. I absolutely love them to bits. They are all very good to me. Since that photo of course we have a granddaughter and a new daughter in law. The 8 of us are below . I was fortunate enough to have a very good education at a leading Manchester Convent School. The nuns were all Irish and I just felt that I was too. The friends I made there are still very important to me 47 years on and last month I attended the wedding of one of them. How lovely to have a group photo of 7 girls who had been at school together all those years ago and are still in contact. I am the third left. I was an infants' teacher for 30 years but was never comfortable doing it although I was deemed to be good at it . At college 42 years ago next month, I met the love of my entire life and we will have been married 38 years in October. In 2008 I left teaching and started my own education drama company in 2010. It is called Yellow Brick Road Workshops and is history/drama based. We go into schools and do workshops with the children. My business partner and I laugh EVERY DAY . My husband and I love classical music and often go to Manchester's Bridgwater Hall to concerts. Religion plays a large part in my life and we have an active church community. It gives us an active social life as well as prayer life. I have been told by many medics that I have Viking hands and must have Viking/Scandinavian ancestry because of this hand condition I have. Consequently, when I got the opportunity to have my ethnicity DNA done I jumped at the opportunity. I sent off my saliva sample in the equipment provided and waited expectantly. I anticipated, 55% English, 44% Irish and 1 % Scandinavian. Well there had to be some Scandinavian somewhere. How wrong was I ? The results came back and we have 7 ethnicities not 3. There are two main regions and 5 sub-regions. Although a British passport holder, British is one of my sub regions genetically. So I AM mainly Irish afterall. It doesn't change anything but at least I know that I am really a Viking and I know whom to blame for my bad hands. The Vikings of course plundered and raped in Ireland so that is possibly where it is from. Therefore, Wife, Mother , Teacher, Business Woman, Historian. Which leaves my favourite role until last, GRANDMOTHER. I expected to love my grandchild but never expected how MUCH I would love him. As grandparents we want to protect them and guard them from harm even more than as parents. As grandparents we know what life's problems lie ahead and we want to stop them happening. I love it though and he makes me laugh. I have added a photo of my big brother Frank Beswick at a family Baptism last weekend. There is a family resemblance between us although of course I am far prettier! I have always thanked God in my prayers but writing 3 things down is just marvellous. You are lucky indeed. Love the photos. Ethnicity is complex, for even if we say that we are a certain amount English [whatever] we have only gone back so far, and as you say there have been migrations in the pastprevious to this date. When English are told that they are such a per cent Ukrainian, this nonsense comes from the fact that of the three groups to settle England after the Ice Age one originated in the Ukraine, and so the thre combine into the first elements of the English population. I would just lump these groups together as English. I am beginning to think that it is more apt to ask with which community one identifies, as this would be a better guide to who you are than tight racial divisions are. Sounds like a wonderful family, Veronica! You've got me wondering about my own ethnic background. Because all four of my grandparents were born in Ireland, I've always assumed I was only Irish, but that's hardly likely with what we know about migrations. Knowing these details opens up a window into the past. Imagine all those stories of your ancestors at a time when travel was more difficult than it is today. Our youngest brother has also had this operation on his hand and his youngest daughter suffers occasionally with her hands already at her young age. Is the problem worse in people with small hands, such as yourself. My genetics are similar to yours, though not identical, but it is noted in the family that I have relatively large hands, certainly larger than those of Bernard, [the other brother in the picture.] Do you think that my relatively large hands might afford some kind of defence against this condition? Slight correction. The book that I cited in an earlier comment is The Origins of the British. Yes indeed , The two brothers pictured are my oldest and youngest . They both married friends of mine so are still friends AND in laws too. Some people of Scandinavian descent have a thick tendon running horizontally across the palm of the hand under the fingers. As we age this tendon in some people of Scandinavian origin starts to thicken even more and nodes develop at the base of each finger. The fingers bend over them and can't be released back without difficulty or else they stick in a bent position. They often need surgery, which I have had on four of my fingers. Veronica, What do Scandinavian/Viking hands look like? In another article, you describe two of your brothers marrying friends of yours. Is the photo of you with Frank and another brother the siblings whose wives are your friends and in-laws? They may be accounting Lancashire as part of the North Midland's genetic community, as it is at the southern end of Northern England. For a good analysis of the genetics of the English read The Blood of the British by Oppenheimer. He states that the aboriginal British after the Ice Age were composed of three groups; one from the Ukraine, one from the Moravian Ice Age Refuge and one from Basqueland. Eastern European DNA.is therefore an element of the Eastern British population's genetic heritage, for despite the historical nonsense we were taught at school, the pre-Saxon Britons were not extincted or forced to Wales, but left descendants in England. While I am convinced by the science of these investigations, I am not convinced by the historical interpretations placed upon the data, which sometimes fail to take into account historical complexities of the population story. If you want some traditional Irish Christmas foods to add to your table this year, read on. Here's a run down of some special Irish Christmas foods.